I was hoping to get some more Port Road Trips out this week, but I've been swamped so I had to settle for some news updates, specifically NS updates. 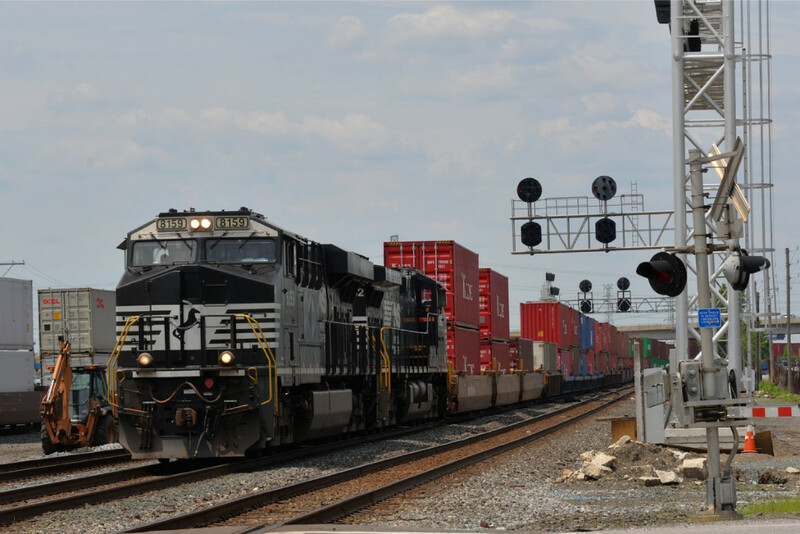 First up is the news regarding the twin Chicago Line interlockings of CP-506 and CP-507 in General Hammond-Whiting, IN. The last of the PRR Position Lights on the western end of the 4-track Broadway are now definitely facing the ax, but you still have a little time at CP-506. You see the new signals have only been partly cut in as the interlocking work is still ongoing and NS just needed to extend the interlocking limits a few feet. This means that the old eastbound PRR gantry has been retired and replaced by new NS signals on a new gantry, a new PRR PL mast signal (!) has temporarily popped up on one yard track and the original PRR PL dwarf has been left in place on the other. It really makes one wonder why they just don't keep the old signals...or at least the temporary replacement signals. At CP-507 new cantilevers are up indicating the 1990's vintage westbound PRR PL cantilever will soon be replaced. The additional length being added to the interlocking could mean some additional switch work. Chicagoland signal fans you still have time to get your pictures so please do not hesitate. Meanwhile, further east, I just got word that NS just cut in the Rule 562 operation between STELL and SHOCKS on the Enola Branch. See the first few segments of Port Road trips for the history of this previously Rule 251 ABS line. What happened to WAGO is not yet know, but we can assume it was re-signaled like STELL. Here is a photo from a visit to STELL in March showing the new cantilever gantry with NS signals with 'C' boards for the Rule 562 operation. EDIT: My source was mistaken and HAROLD tower is NOT being demolished (at least not yet). It's still an interesting story of HAROLD living on as a zombie interlocking tower. For over two decades now the Long Island Rail Road's HAROLD tower has held a special place in interlocking tower lore. The massive interlocking, across the East River in Sunnyside, Queens, is second only to the Jamaica complex in terms of traffic density and rivals the likes of DOCK and UNION on the other side of the HUDSON. The interlocking was so critical to the daily flow of commuters on North America's busiest commuter railroad that when the interlocking was re-signaled in 1990, the old 1910 vintage structure was actually replaced by a brand new manned interlocking tower, perhaps the last traditional type interlocking tower built on the continent. Granted the new tower was rather austere, much like NJT Terminal Tower that predated it by a few years, but it was still a interlocking station, manned 24/7, on a railroad that still has a thing for manned interlocking stations. Clearly it's future would be meaningful. At this point HAROLD became a "zombie tower", operating "as needed", never open, but not officially closed. Now the following is all based on anecdotes I have heard over the years, so take them as you may, but as I understand it, in the early days HAROLD was actually opened infrequently as the bugs were worked out of the computerized system in PSCC. Like the old "Harold Protect Job" I heard stories of the tower being manned at peak time, but only operating if something went screwy. Others say that qualified operators were simply on standby at other locations with the ability to open HAROLD in a hurry. I heard it was opened for certain demanding situation like a shut down East River Tube or disabled trains. Whatever the truth was, by the mid-2000's it was clear that HAROLD was only open once in a blue moon, if at all. The real interlockig is across the tracks in the massive relay shed. While many people told me that HAROLD was closed, closed, closed, I always suspected that it was still in its state of living death. As long as the interlocking was not re-signaled (again), I doubted that anyone would go about ripping out the interlocking machine inside the tower. Even if it was only a glorified local control board, if HAROLD still looked like a tower and was still capable of the functions of a tower...well it was still an active tower. Well, I finally got word that it was closed for good and if you are wondering what sort of evidence convinced me of that it is the fact that the tower is being demolished for the East Side Access project. HAROLD interlocking itself had been drastically altered and re-signaled to make way for the tunnels that will divert LIRR trains to Grand Central so I it figures that an old relic of the not too distant past...a plain brick box of limited usefulness, would not get much sympathy from planners and engineers. 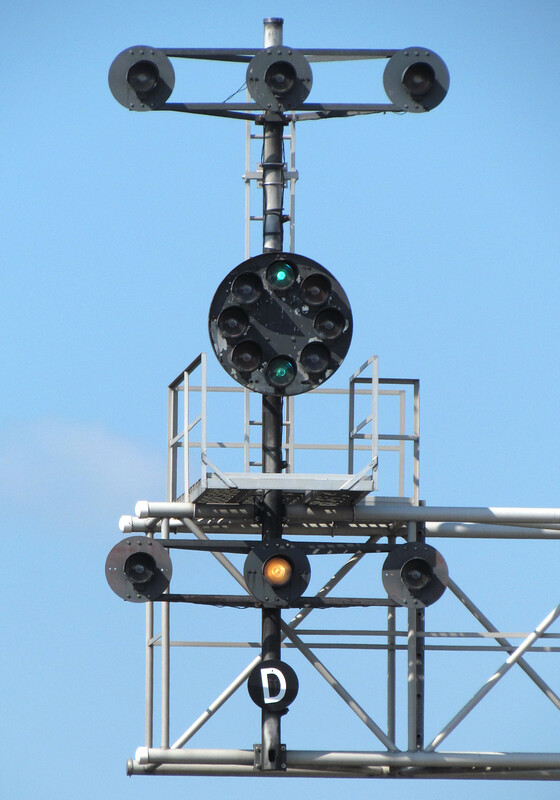 So, like the PRR position lights that populated the area like weeds, HAROLD is no more. Farewell HAROLD. You were bland and boring, but in an age of ever dwindling numbers of towers we took what we could get. PS: If anyone has any actual information regarding HAROLD's operation in its later days, or better yet pictures taken inside, let me know and I'll update this post. Signal engineers and signal departments aren't stupid. 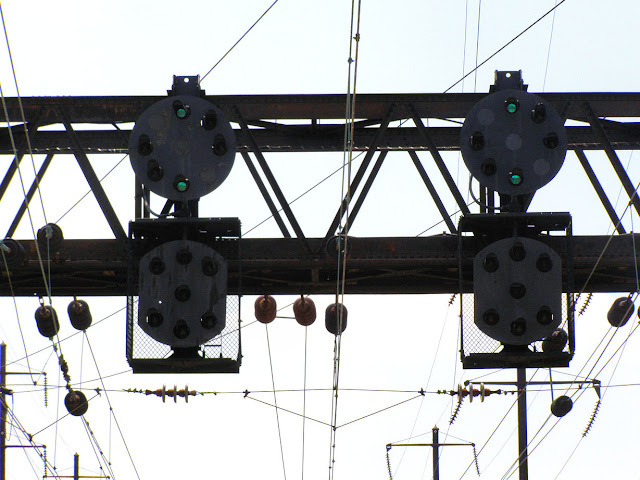 If a signal doesn't need to display certain signal aspects then typically those lamps are omitted from the signal. With vital signaling hardware costing potentially thousands of dollars per lamp, all of that adds up and more often than not the casual viewer is presented with a watered down version of what they might see in the rulebook. Well today we will find examples across a variety of railroads of signals that don't leave anything behind in the locker room and come equipped to...show it all. We'll kick off with an easy one in the form of a PRR/Amtrak position light. With only two heads it doesn't look like it would be hard to fill up a PRR PL, but both Amtrak and the PRR do make use of an economical lower head that omits the \ position when possible. 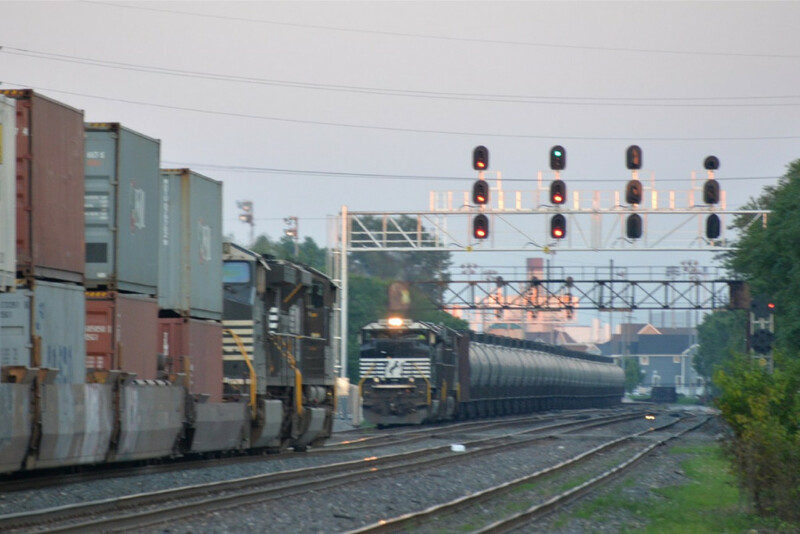 Substituting Rule 290 Restricting for Rule 291 Stop and Proceed produces only a minimal decrease in efficiency so the \ is only included in situations where there are regular movements into unsignaled track leaving the SnP dot for movements into an occupied block. NORAC color light signals are typically built around two head masts, but every so often the third head makes an appearance. This is either when there are slow speed routes or back to back interlockings requiring R/Y/G Medium Approach Medium. Of course the more spectacular complete signal is the B&O CPL with a full central target and all six orbitals. These were especially rare due to the need to have a back to back interlocking with slow speed signals at the next interlocking down to allow for both Approach Slow and Medium Approach Slow. Due to a similar preference for Stop and Proceed over Restricting, one also tended to need routes into un-signaled track. As a result this signal went extinct in the wild twice. The first being after LAUGHLIN JCT and CURTIS were downgraded and/or resignaled and then again when CARROLL interlocking was first upgraded in 2007, only to be resignaled in 2012. Sticking with the Chessie system, the C&O's example of a full signal was quite a bit more common than the B&O's. The use of R/Y/Y for Medium Approach made lower heads rather common. Add in R/Y/G for Medium Approach Slow (or Medium) and you'll get a complete 3-3-2 configuration as seen above. 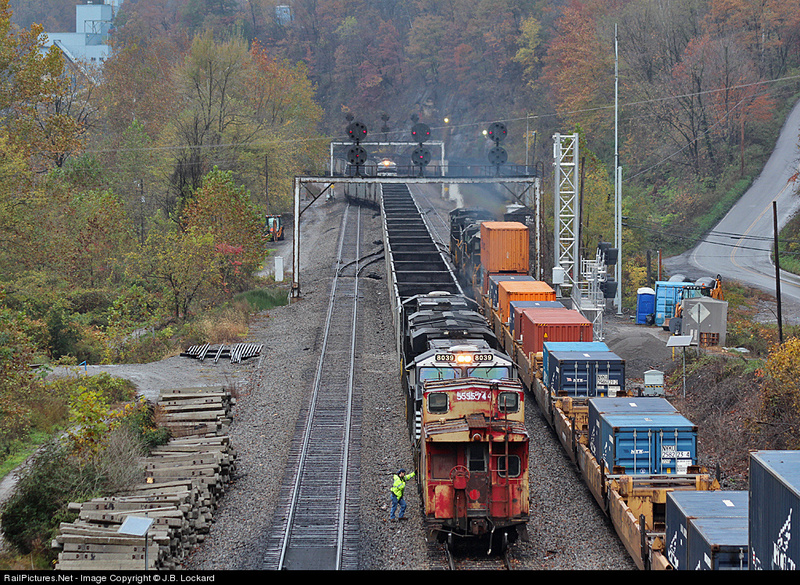 CSX SATERWHITE interlocking at the Point of Rocks wye complex. The Seaboard system makes use of Lunar white for Restricting indications which results in the use of 4-lamp signal heads. Add slow speed indications into the max and you have 3-4-3 or 3-3-4 lamps combinations on a single mast. 3 by 3 in Salisbury, NC. Moving into route signaled systems the Southern Railway most commonly saw 3 x 2 masts with no capacity for Restricting or 3-3-2 when their R/R/Y Restricting indication was required. 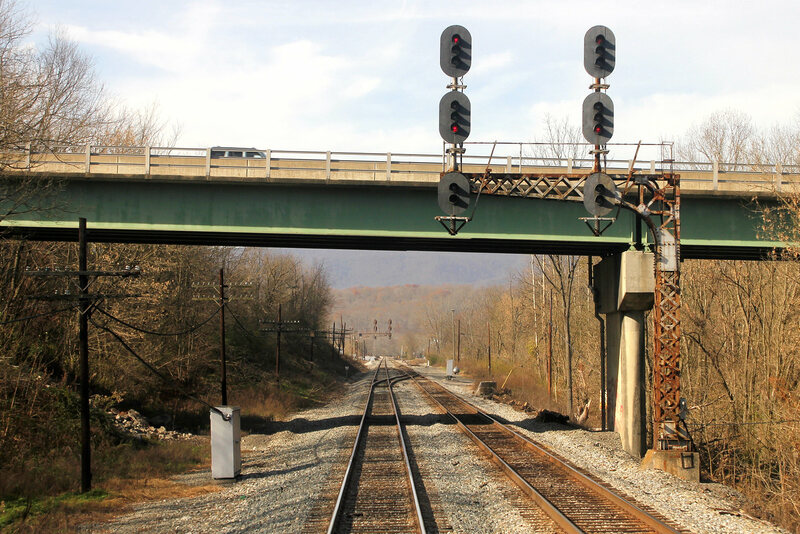 While technically speed signaled, every so often a second, possibly slower speed, route at an interlocking would demand use of a fully equipped third head as seen above displaying Diverging (slow) Clear. The late great HULL interlocking. 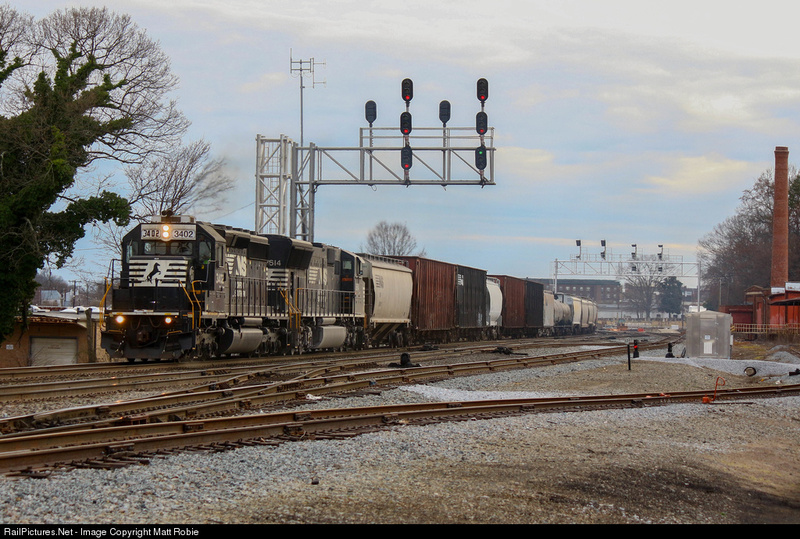 The N&W PL system has it even easier than it's PRR cousin to force a full signal. 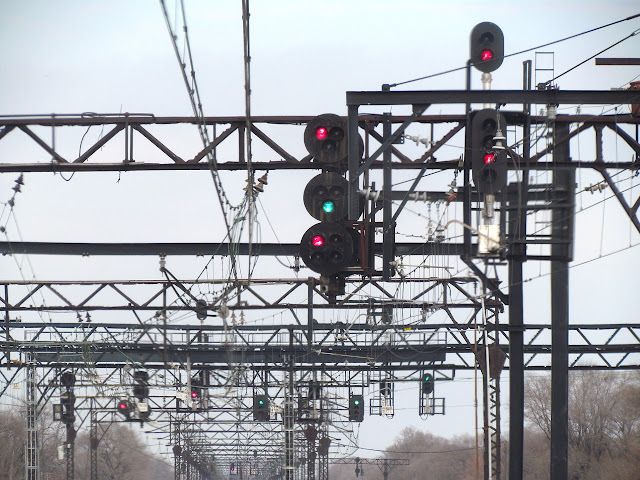 Without the central market option for a Stop and Proceed, any need to enter an occupied or unsignaled track triggers the need for a lower head \. Standard use of Diverging Approach covers the / position as well. Chicagoland commuter system METRA uses a "lunar only" restricting setup similar to CSX, but with route signaling full signals are very rare. Here is an interesting example at KENSINGTON interlocking on the METRA ELECTRIC. 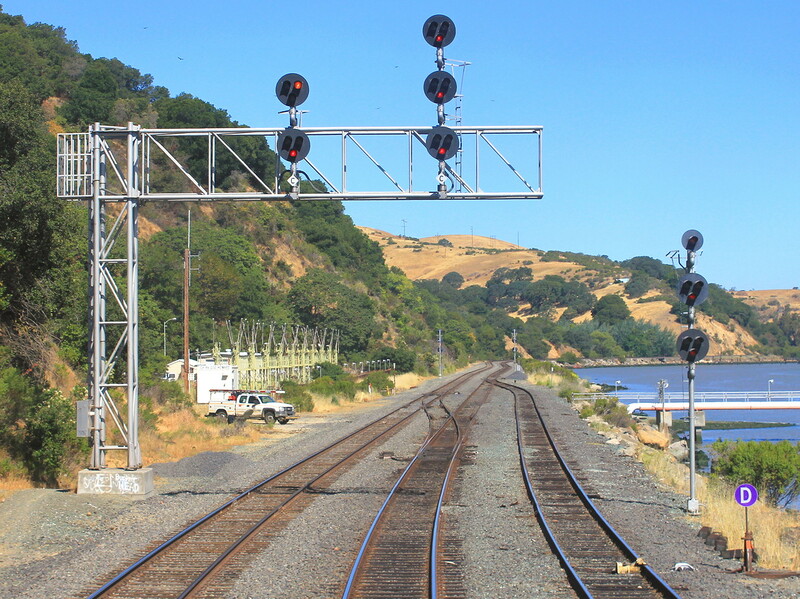 Western roads UP and BNSF both use similar systems that have long used *R* for Restricting allowing 3 by 3 lamp heads to display all necessary indications. As usual the lowest head is most difficult to populate needing a lower speed route to trigger the R/R/G aspect that provides the only use for G on the lowest head. However there is one signal that we've left out. 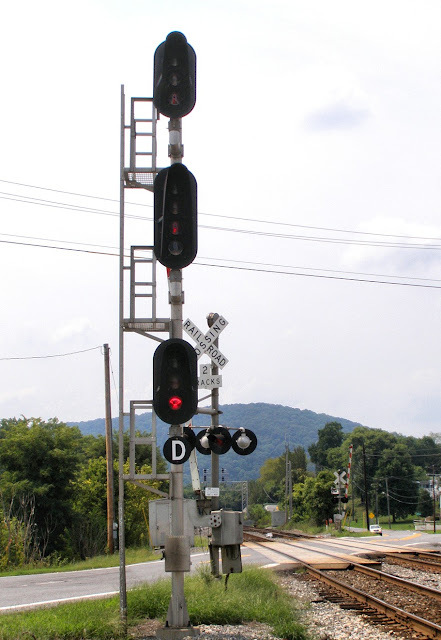 This is the Y/L "Approach Restricting" typically used to signal an upcoming route into a siding on a single track main line. With no Y/*R* option, Approach Restricting requires a lunar lamp and combined with the need for a second slower speed route one would see a 3-4-3 or 3-3-4 signal, just like on METRA or CSX. These however are incredibly rare. So rare that I do not have a photo of one in my collection (although I am sure one exists somewhere). 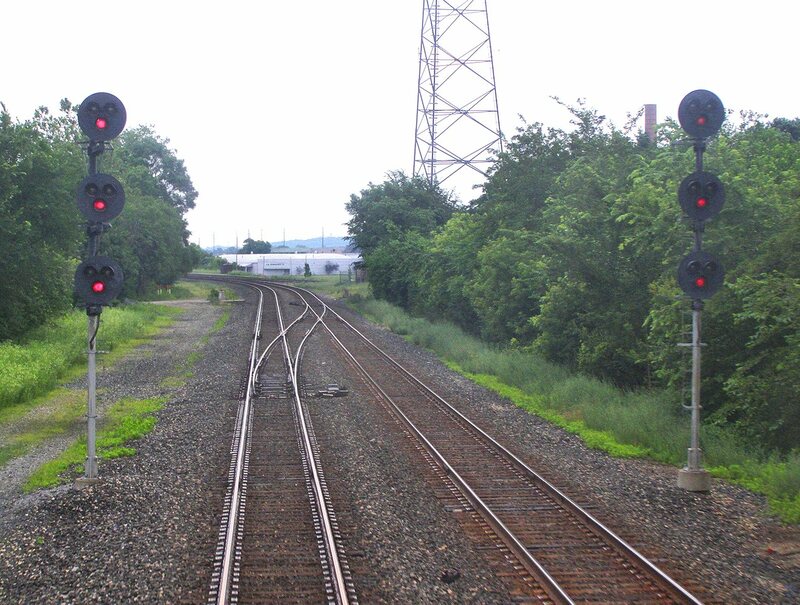 As UP has a new policy of using Approach Restricting at places with common routes into unsignaled track, UP is the more likely road to have a full signal of this type. 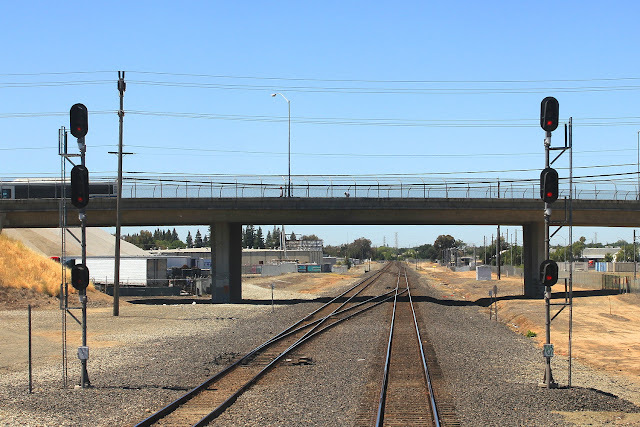 The best I could find was this 9-lampbeast in a 3-4-2 configuration at SWANSTON interlocking near Roseville, CA.